Lutron has revamped their Lightshow Publication, geared more towards designers now. There are some great tidbits in the new Spring 2011 issue. First of all, they offer a nice explanation of the difference between Color Temperature and Color Rendering. When I first started in the lighting business, I had the hardest time grasping these concepts. I wish I'd had their 2-page explanation back then! "Color rendering measures how well light renders colors in objects. 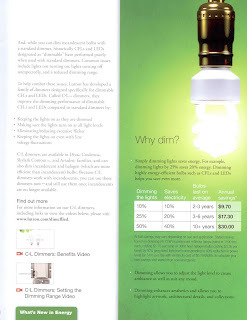 The Color Rendering Index (CRI) compares color rendering for bulbs of the same temperature." And then we have Color Temperature, which "is a visual reference that describes the appearance of white light. The lower the number, the warmer the light", (using a Kelvin scale). They go on to say, "Color temperature is important because the temperature of a particular light source can change the way your eye perceives colors. For example, the same fabric that appears red in one light may look closer to orange in another." 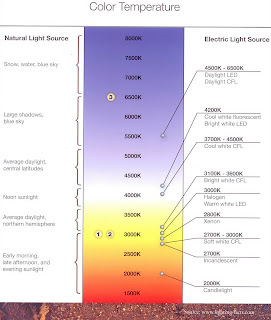 This chart provides a nice visual for what tone you will get with the different Kelvin ratings of the bulbs you are considering. Color rendition is the effect of the lamp's light spectrum on the color appearance of objects. "Cool" colors have higher Kelvin temperatures (3600–5500 K). "Warm" colors have lower color temperatures (2700–3500 K). 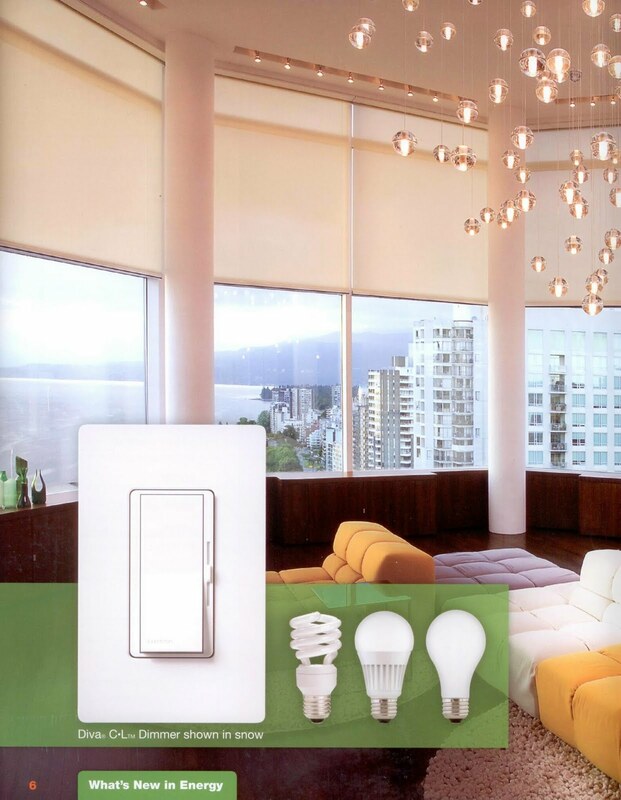 Next, Lutron talks about dimming, their specialty! This picture shows the "Diva C-L Dimmer" in their white color called "snow". And last is my favorite little chart that shows how much electricity you save and how much longer your bulbs will last, depending on how much you dim them. If you dim just 10% (which is not perceptable to the human eye), you save 10% electricity and double the life of your light bulbs. Fabulous! If you'd like to learn more, you can read the whole issue at www.lutron.com/lightshow.